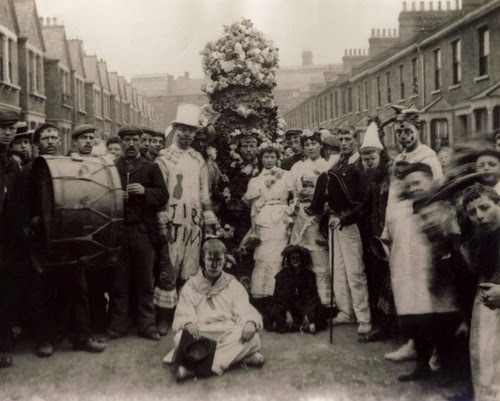 Deptford's Fowlers Troop take to the streets as always this May Day with their Jack in the Green procession. They'll be assembling at the Dog and Bell at 11am on Friday morning and setting off to Greenwich to end up at the Ashburnham Arms (25 Ashburnham Grove) by 4.30pm (via the Lord Hood, Plume of Feathers and Richard 1st pubs along the way). The picture above was taken in 2006 to commemorate the 1906 photo (below) taken by Thankfull Sturdee. 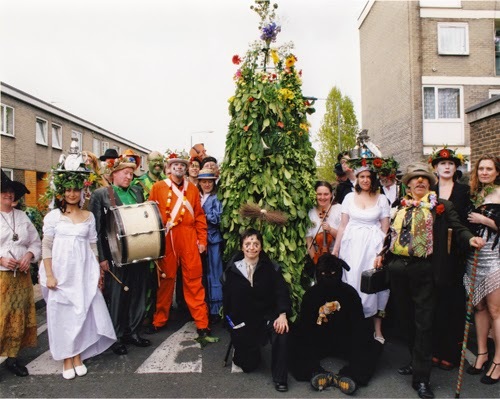 The Jack is the tall chap in the middle, dressed in garlands of leaves and flowers. Perhaps because of their affiliation with the City of London Jack in the Green (whose troop like to cause mischief on a working day), the Deptford Fowlers Troop stick solidly to May Day itself rather than moving the parade to the bank holiday like other revivals of the tradition in Hastings, Rochester and Whitstable. Those weekend-long celebrations draw large crowds and include a lot more local residents dressing up and painting themselves green. However, the Deptford Jack is purportedly the tallest and heaviest of all the modern Jacks! Catch 'em (or join them) 'dressing the Jack' on Thursday 30th at the Dog and Bell from 8pm. And if you're about on Friday, follow or join in the parade. Check the route here. The first of what is now to be a weekly street food market. The Deptford Dame points out this is the third time it's been tried and fears there may still be not enough demand to make it worthwhile for the traders themselves. Not being an evening event, it's certainly not as trendy an event as Lewisham Model Market which returned to Lewisham High Street last week, but as a food-orientated attraction it's not as poncey as the Deptford Brunch Club and you can do a bit of shopping as well. Co-incidentally, The Secret History of Our Streets – featuring Deptford High Street in the first episode – is being repeated on BBC4 (catch it on i-Player). The documentary uses film footage from Hide and Seek (see the Film Festival above), funnily enough. When Secret History was first broadcast in 2012 it caused controversy locally. We had our own critical opinion of the episode's inaccuracies (here, here and here) having originally helped contribute to its making in 2011. Also see Deptford Misc's take on it. But it's worth watching to hear how Deptford High Street was once the "Oxford Street of south London". Another demand was for public toilets– the Lounge was built on the site of the previous public loos and doesn't open until 10am. Most demands were led by People Before Profit (in an open attack on the Labour councillors); PB4P touched on a subject that was of no interest to legitimate businesses when they called for an end to frequent harassment from the UK Border Police. How can we make Deptford a better place to live, work and play? DNA is a small local group of people who have got together to create A Neighbourhood Plan for Deptford. The Neighbourhood Plan idea has grown out of the Localism Act and the DCLG (Dept of Communities and Local Government) funds the charity Locality to help and advise communities on how to create a plan and achieve other objectives – such as saving buildings or places as Assets of Community Value, or helping local campaigns and social action, or those who want to set up social enterprises. Have a look at the Locality website – it's hard to believe it's funded by this present government! Locality are helping DNA (Deptford Neighbourhood Action) through the process of creating a plan, and the first thing they must do is identify a few things, such as: the area they want to cover, the existing organisations who can contribute, priorities for residents and businesses, and that (perhaps indefinable) thing, Deptford's identity. It's a huge task and they need your help and input! As the video shows, they simply can't do it without you. Locality will be there to explain how Neighbourhood Plans work and invite your ideas about what is important for Deptford. Everyone is welcome. If you can't make it on Saturday afternoon, but want to contribute in the future or show your interest or support, you can register your interest here. A Neighbourhood Plan, once complete, becomes a statutory document that the Council must take into consideration. DNA see it as an opportunity to give local people a voice and influence in Council decisions. As a lobby group, DNA will be able to access grants via Locality and start making some changes which you can have a say in. Such a plan cannot block developments and it can't override any formally adopted strategic plans the local authority has in place. Even the Council itself overrides its own noble aims when faced with market forces or central government interference. A Neighbourhood Plan can't change everything, but it could change some things, and the Council will have to listen.